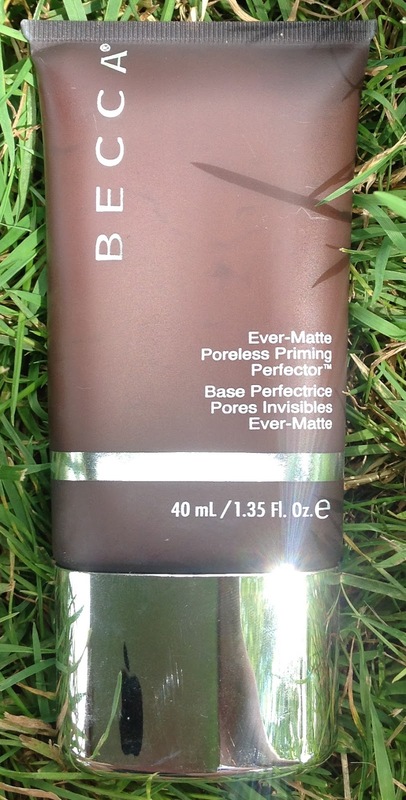 A little while ago I purchased Becca's Ever Matte primer in search (yet again) for a primer that would actually reduce the appearance of pores on my face and help keep me matte during the day. Primers are supposed to also improve the application and wear-time of your foundation too, but honestly I expect those things from my foundation to start with, for me I want a primer to help my skin look smooth and flawless (which if you don't know already, it's about as far from perfect as it can get sometimes). 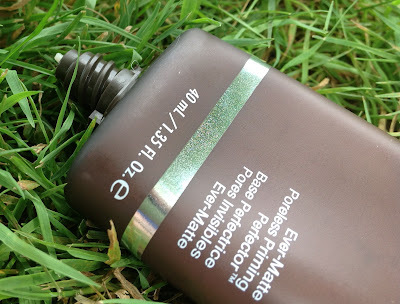 I must say that although this primer is different than any other primer I've tried before I really like it. At first I was a little wary as this stuff is thick! There is a major trick to this primer and to get it to work. See how thick it is? Firstly you need to make sure you shake the bottle before use. Then you squeeze out the smallest amount and warm the product up between your fingers so it becomes more emollient. Then working quickly spread it onto the places of your face that get oily. Due to the thickness of this product I don't recommend using it anywhere you don't get oily. I personally only use it on my nose, centre of my forehead in the middle of my chin and the top of my cheekbones where my pores are the largest as well. 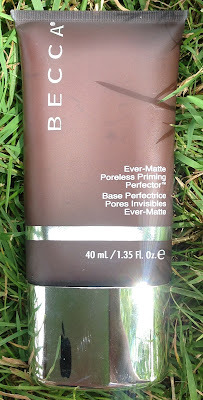 I wouldn't say it makes my pores invisible as it says in the name but it does reduce the look of them and best of all it keeps me matte all day. Plus you need so little this bottle is going to last me a while. Once it's on this feels almost powdery and satin-like. If you spread it thin enough you can barely feel it in my opinion though some people may find it too thick or film-like for them. 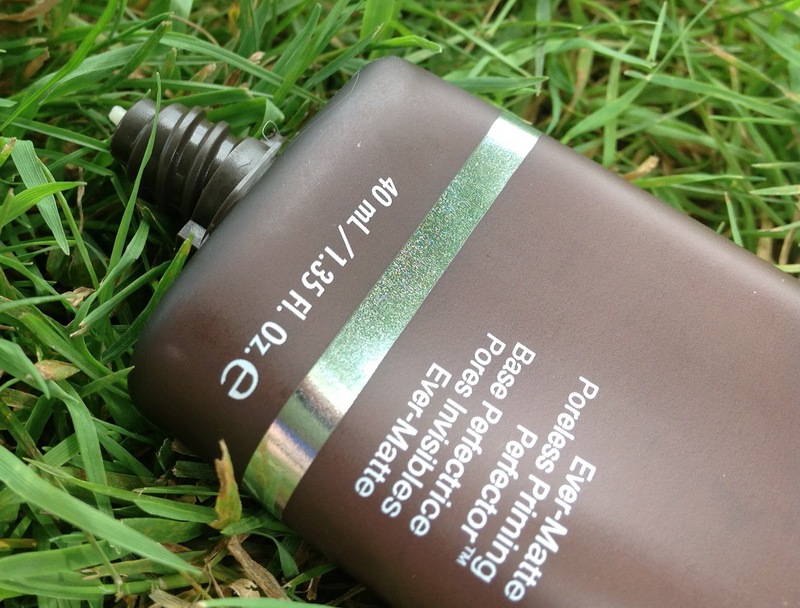 To me it's a much nicer feeling than the oily feeling my forehead and t-zone becomes after a couple hours. Plus if you forget to put it on before your foundation it works just as well if you dab some on over-top. In addition to this it has a simple ingredient list and is okay for my super sensitive acne-prone skin. The only thing in it that could cause problems is Butylene Glycol (a solvent and moisturizer) but it's only rated a 1 out of 5 on the comedogenic scale, the rest of the ingredients are all zeros. Plus there isn't any silicones in this either (a group of ingredients that causes my skin trauma). Heres the ingredients list: Water, Magnesium Aluminum Silicate, Propylene Glycol, Phenoxyethanol, Methylparaben, Propylparaben, Butylene Glycol, Enantia Chlorantha Bark Extract, Oleanolic Acid. Unfortunately Becca is an expensive brand so if you're going to get this ( $44 CND for 1.35 oz) I recommend getting it on sale. You can get it from Sephora (they have biannual sales for Beauty Insiders getting 10- 15% off.) Dermstore stocks it as well and they occasionally have sales too. I purchased mine from Artisan Boutique online because they seem to have a 20% off weekend seemingly every other month (sometimes more). I sign-up for their e-mail to get sales alerts, so I got my Becca primer 20% off. Overall, though this is a bit finicky to work with I love this product. For anything professional or occasion I want to look my best I can see myself using this. It can feel a tad much for casual days, but I can see this becoming a staple in my stash. Rating: 9/10 This lost half a point for price and half a point for not perfectly concealing the look of pores. Other than that I really like this. Very unique, excellent ingredients, and it works so well. Would I buy this again? Yes. I like this better than many of the other primers out there, plus it doesn't break me out which is a huge plus. 10 Favourite Things for Autumn!